MacArthur Park’s private dining facilities were specially designed for parties, cocktail receptions, business meetings, anniversaries, weddings, rehearsal dinners and other celebrations. Celebrate your favorite grad at Mac Park. Call us today to book a beautiful graduation event. We offer distinctive rooms that accommodate a variety of events. Two lofts overlook the main dining room and each accommodates twenty four people comfortably. Great for semi private gatherings where guests can admire the architecture tucked up above the main dining room floor. An ideal venue for more intimate groups, the Camp Freemont room boasts large windows and French doors that open out onto the back patio. 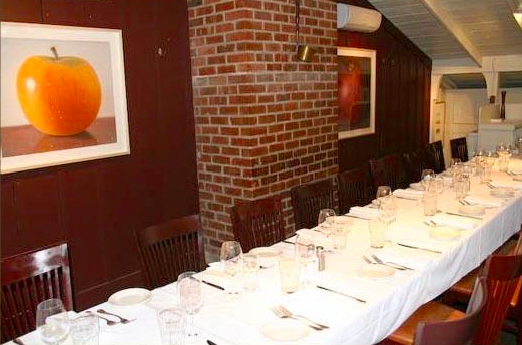 This room is a popular setting for small rehearsal dinners, meetings and surprise parties. Accommodates 24 guests. The Veterans room is our largest room at MacArthur Park, hosting one hundred people and has a built in bar area. This historic room is ideal for wedding receptions, reunions, large dinner parties and corporate meetings. French doors open out to a deck overlooking our lush patio, ideal for a wedding ceremony and cocktail hour. Dancing is available inside or outside on the patio floor. 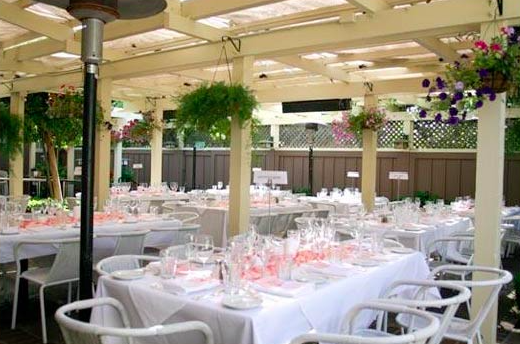 Palo Alto’s temperate climate makes alfresco gatherings on the patio irresistible! Enclosed on all sides and graced with delicate fine gardens this is a lovely settings for small wedding ceremonies, receptions, cocktail parties, lunches or dinner parties and accommodates dancing. Please fill out the form below to request more information about our private dining spaces. MacArthur Park was recently selected by The Menlo Park-Atherton Education Foundation for their annual online auction. “It’s really a great place to have a party, the food is so good,” said Susannah Hill, the foundation director, who felt the event went even better than planned. The Menlo Park-Atherton Education Foundation held its “Superhero Bash” on Saturday, March 25, 2017, at the MacArthur Park Restaurant located on University Avenue in Palo Alto. The event kicked off an annual online auction that began runs thru Monday, April 3.